The last couple of weeks I’ve made this salmon more than once. The slices of home cured salmon are much nicer than the ones you get from supermarket packages, and really, there is nothing to it, except a little wait. It takes from 48 to 72 hours (yes, 2 to 3 days) before the salmon has cured and is ready to eat. A mixture of salt, sugar, pepper and dill dries out the salmon and you get a dark meat, firm texture and delicious flavor. Slice the salmon into 2 pieces of equal size. (You will tie them together, sandwich-style, later). Crush the pepper in a mortar or with a rolling pin. Make a rub of the salt, sugar and pepper and rub it into the salmon flesh, make sure to cover everything. Then chop up your fresh dill and put on one piece, add the other piece on top, sandwich style. Put on a large piece of alufoil or clingfilm and cover tightly. Now put it in the fridge, with or without a heavy object on top. I’ve experimented with both: the first time I only put on like two bottles of beer (light weight), and turned every day. 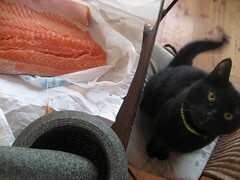 That salmon came out beautifully, succulent, delicious. The other time I might have put in too much salt (I thought I knew the recipe by heart) , and weighed with the mortar on top (heavy weight), also turning every day, and that salmon came out dryer, but much saltier. I think I prefer the former.